Finally, Islamabad, the capital of the country, has started its journey towards normalcy following a three-week long sit-in by the Tehreek-e-Labbaik Ya Rasool Allah (TLYR). The sit-in ended after the government’s explicit surrender to the demands of the agitators. Pakistan Today here looks at the causes that led to the initiation of the sit-in and its subsequent culmination. Daily life in the capital was paralysed for at least three weeks due to the protest of an alliance of religious parties, including the Tehreek-e-Khatm-e-Nabuwwat, Tehreek Labaik Ya Rasool Allah (TLY) and Sunni Tehreek Pakistan (ST), calling for the sacking of Law Minister Zahid Hamid and strict action against those behind the amendment to the Khatam-e-Nabuwwat clause ─ which had earlier been deemed a “clerical error” and subsequently rectified. The agitators believed that during the passage of Elections Act 2017, the Khatm-i-Nabuwwat oath was deliberately modified as part of a larger conspiracy. The Islamabad High Court, the Supreme Court and the heads of various religious parties had repeatedly called on the protesters to disband or use the Democracy and Speech Corner at Islamabad’s Parade Ground to register their protest. Eventually, the stubbornness of the protesters led to a day-long operation which ended in disaster, sparking countrywide protests by the religious parties. October 02: It all started with the Elections Bill 2017 when a clause in the bill relating to a candidate’s belief in the finality of the prophethood of Prophet Muhammad (peace be upon him) ─ the Khatm-e-Nabuwwat oath—was replaced with the words “I believe” in place of “I solemnly swear”. October 04: Following the error, then law minister Zahid Hamid defended the bill, saying that it was not meant to repeal the Khatm-e-Nabuwwat laws. The same day, National Assembly Speaker Ayaz Sadiq had, however, accepted that a “clerical error” was responsible for the change in the Khatm-e-Nabuwwat oath. The speaker met with parliamentary leaders, and all political parties agreed to revert to the original declaration. October 05: The bill was amended to restore the oath to its original form. October 30: Islamabad admin warned the Tehreek activist to move to the Parade Ground instead of protesting at the Jinnah Avenue. The admin had said at the time that police were able to resolve the issue and that a few of the protesters had been rounded up and taken to various police stations for legal action. 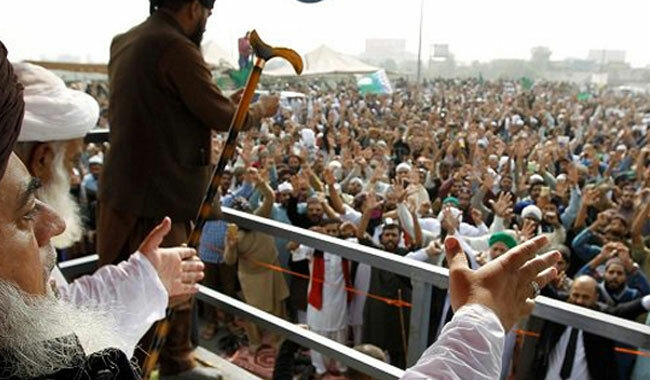 November 5: TLYP and Sunni Tehreek were forbidden to hold a rally in the capital due to a ban on public gathering in the city. November 6: Police in Islamabad sought a grant of over Rs70million to maintain peace ahead of the arrival of a rally by religious parties which began from Lahore on Monday and will converge in the capital. November 8: Faizabad Interchange was blocked by the protesters, along with Metro Bus Authority. November 9: Blocked roads led to a death of an infant. Subsequently, an FIR was registered against chief of TLYP Khadim Hussain Rizvi under Section 322 of the Pakistan Penal Code, which deals with qatl-bis-sabab (unintentional murder). November 10: Islamabad police booked Khadim Hussain Rizvi, Pir Aijaz Afzal and other leaders and participants of the sit-in. November 11: The leaders of the sit-in hurled threats at the federal ministers, threating with dire consequences if their demands were not met. The threats were made in the Friday sermon delivered by Almi Tanzeem Ahle Sunnat leader Pir Afzal Qadri. November 12: Optimistic Interior Minister Ahsan Iqbal showed resolve to persuade the agitators for evicting the interchange and moving to Parade Ground. Protesters remained defiant, ready to sacrifice their lives if they were met with force. November 14: IHC Justice Shaukat Aziz Siddiqui, while hearing a petition filed by a Tehreek-i-Khatm-i-Nabuwwat supporter, ordered the government to reverse in the Elections Act 2017 all amendments in sections pertaining to the Khatm-i-Nabuwwat oath. Security was beefed up following an assault on the police by the TLYR protesters. November 15: Clerics let go of most of their demands, asked IHC to publicise findings of enquiry into amendment in legislation, release of the Raja Zafarul Haq report investigating who was responsible for the changes to the Khatm-i-Nabuwwat oath, and action against the culprits. November 16: The IHC Justice Shaukat Aziz Siddiqui directed the protesting clerics to immediately vacate the Faizabad Interchange and show respect for the law. November 17: The IHC ordered the Islamabad administration to clear the intersection by “any means necessary”. Subsequently, the government issued a “last warning” asking protesters to peacefully vacate the venue by 10pm on Friday night, or face force. The district administration, meanwhile, was ordered to take all necessary steps to clear the sit-in by the next morning. All hospitals in the city were ordered to cancel doctors and paramedical staff’s leaves and ask them to be present on duty till further instructions. The first deadline to vacate the area lapsed without any action on the part of the protesters. November 18: On Saturday morning, a heavy contingent of Islamabad Police, Frontier Corps and Rangers personnel ─ equipped with tear gas and shell guns ─ arrived at the Faizabad Interchange. Interior Minister Ahsan Iqbal asked the IHC for an extension in the deadline, in an attempt to placate the protesters. Ruet-i-Hilal Committee chief Mufti Muneebur Rehman urged both the government and protesters to find a solution to the issue. However, the protesters refused to budge. November 20: A meeting between representatives of the protesters and government ministers held at Punjab House was unable to make any breakthrough. Islamabad police arrested a suspect allegedly carrying 2kg of explosive material near Faizabad Interchange. November 21: The Supreme Court took suo motu notice of the sit-in. November 22: The ISPR chief in a presser asked the government to resolve the issue through peaceful means, besides saying the military would abide by whatever decision the government would take. November 23: Interior Minister Ahsan Iqbal said the government machinery is capable of clearing Islamabad’s Faizabad Interchange of religious protesters within three hours if assured against the propagation of the sensitive issue. The government’s offer to change the portfolio of the law minister, or send him on leave, was turned down by the sit-in’s leaders. November 24: The IHC issued a show-cause notice for contempt of court to Interior Minister Ahsan Iqbal over his failure to end the sit-in. Admin issued last warning issued to the protesters. Lights around the venue were turned off before the crackdown. A final deadline issued to the protesters to disperse by 7 am on Saturday went ignored. November 25: Law enforcement agencies launched a day-long operation, which, however, was suspended later in the day. During the operation, the army spokesperson tweeted that the army chief asked the prime minister to “handle the Islamabad dharna peacefully” as violence was not in “national interest”. As many as eight to 10 people were killed and hundreds wounded during the operation, but it failed to clear protesters from the Faizabad Interchange. The botched operation sparked countrywide protests. The protesters chanted anti-government slogans and blocked major roads. In many areas, protesters attacked LEAs and damaged public property. The Pakistan Electronic Media Regulatory Authority (PEMRA) put a ban on live coverage of various TV channels and blocked Facebook, Twitter and other social media websites. Security forces backed off as protesters regained their ground. Subsequently, the administration requested army deployment in the capital to cope with the agitators. November 26: No sign of the army in the capital till morning; however, the army had ‘agreed’ to the request, but demanded the government to address some of their reservations prior to the deployment of troops. Dawn reported, “A high-level meeting was held in which Chief of Army Staff Gen Qamar Bajwa told Prime Minister Shahid Khaqan Abbasi that he opposed the army’s use of force against its own people since the population’s trust in the institution of the army “can’t be compromised for little gains”. The federal government then called in the Punjab Rangers to lead civilian law-enforcement agencies handling the sit-in. November 27: The government caved in to the demands of the protesting clerics as Zahid Hamid resigned. The agreement signed between protesters and government credited the army chief and his representative team for their “special efforts”. Khadim Hussain Rizvi directed his followers across the country to pack up and leave; however, the protesters in Lahore did not pay heed to his directives as they remained pitched in hoping Rana Sanaullah, Punjab law minister, would resign under pressure. The protesters at Faizabad started packing up their belongings and police started removing containers placed around the protest site around 8 am. IHC judge lambasted government and military, saying who gave the military the right to act as a mediator.